Malta. In the center of the Mediterranean, there is a tiny island group with a fascinating history. From times immemorial its sunny and natural harbors have sheltered prehistoric people, pirates, Phoenicians, Romans, Christians, Byzantines and Arabs. These are the islands of rocky creeks, small coves of red sand, underwater caves, yellow colored stone buildings and mythical megalithic cultures forever lost in history. Malta became world famous after the heroic Knights of St John, who settled on the island, defeated the imposing Turks in 1565. Come with us and discover these islands known for their friendly people, year-around sunshine and intriguing history. 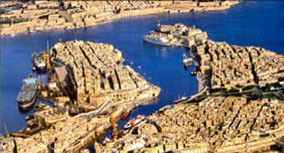 Day 2: Full day tour to temples/ Marsaxlokk/ Blue Grotto. Board coach for a full day tour with your guide. We will visit the Temples of Hagar Qim. You will certainly be impressed by its gigantic stone blocks, and its neatly arranged facade. A shrine was built in the outer wall. Several characteristics of temple building can be discovered: The rope holes, the roller stones, the apsidal arrangement, the pitted decoration, and the oracular chamber. Several fat "Venuses" of Malta were discovered here too. Near Hagar Qim are the three Temples of Mnajdra situated in unspoiled settings on the cliffside overlooking the sea. The upper temple contains a shrine and an altar. The lower temple has a more imposing entrance reached by steps. The south unit of the temples complex is perfectly aligned with the rising sun at equinox. Also to be noticed are the corbelling sections of these temples. Lying beyond the cliffs of Wied iz-Zurrieq is the Blue Grotto. It can only be reached by sea. Weather permitting, we may board a fishing boat and sail to the Grotto itself (optional). We will then visit Marsaxlokk, Malta's largest fishing village. Stroll along the waterfront market and watch the fishermen at work in their colorful boats. On to Borg in-Nadur. A group of oval huts dating from the Bronze Age. We then visit Ghar Dalam cave at Birzebugga. This 144 meter long natural cave has remains of animals such as dwarf elephant, and hippopotamus, dating back to the glacial period. The massive stalagmites and stalactites reveal its antiquity. return to the hotel, dinner and overnight. Day 3: Full day tour: Valletta. Transfer by coach from hotel to Valletta. We start our tour of Valletta with a visit to Upper Barracca Gardens. Situated near the entrance of the city, these gardens offer a magnificent panoramic view over the Grand Harbour and the historic Three Cities on the opposite promontories . We will visit one of the jewels of Malta: St John's Co-Cathedral housing the famous "Beheading of St John" by Caravaggio, and many treasures of the knights. Stop for lunch. After lunch we will visit the Grand Master's palace, which the armory and the portraits of the Grand Masters of the Knights of St John. Your guide will tell you the story about the famous knights whose heroism thwarted the feared Turks advancing into Southern Europe. We will also see the Tapestry Chambers containing beautiful Goblin tapestries. Next, we continue or tour with a visit the National Museum of Archaeology where several artifacts and figurines found in Malta's pre-historic temples are displayed. 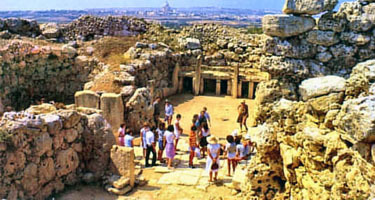 This experience will give us an insight into the rich archaeological past of Malta. return to the hotel, dinner and overnight. Board coach for transfer to Cirkewwa ferry terminal and vice-versa. Ferry crossing to the Island of Gozo. Gozitan coastal village of Xlendi before heading back to Malta. Board coach for a full day tour.Visit The Three Cities of the Cottoner -three harbour towns older than Valletta and first residence for the knights of St.John.Next visit Senglea,a fortified town called after grand Master Claude de le Sengle.Drive to Cospicua,also called Bormla,one can find teh magnificent Parish Church,with its Otratory full of unique masterpieces.The next place in the Itinerary is Vittoriosa,better known as Birgu,one can find the residence of many of the well known knights.Here you can also find the Maritim Museum,and the Folk Museum in the Inquisitors's Palace.Here one walks through the narrow streets to admire the architecture of the old buildings.Stop for lunch. Harbour Cruise-75 minutes voyage around the Marsamxett harbour and Grand Harbour.Some free time in Sliema-popular for its many quaint cafes&shops. Board coach for a full day tour. 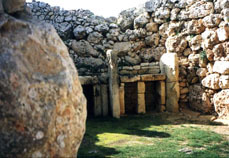 Today we first visit the Megalithic Temples of Tarxien. These four temples bear witness to the aesthetic and technical capabilities of our ancestors. Several sculptures and ceramics were found on this site, and transferred to the Archaeological museum in Valletta. Visit:-Dingli Cliffs,the highest point in Malta.Enjoy the spectacular view.You will see Cart Ruts,dating back to teh Bronze age roughly between 1500 and 700BC.Some archaeologists tend to believe that they were intended for the transport of heavy blocks of stone from the quarry face. 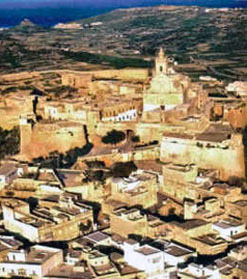 Stop for lunch.Drive to Burmarrad and Mgarr.Visit:San Pawl Milqghi-Roman site and chapel,Ta Hagrat Tempel-comprises two trefoil temples,and Skorba-three apse temple from the Ggantija phase. Board coach for full day tour. departure to Rabat to visit St Paul's Catacombs, the early Christian burial chambers, that are hewn into the rock like an underground maze. Proceed to St Agatha's Catacombs-these catacombs served as the actual hiding place for St.Agatha who fled from the persecution of the Roman Emperor Decius(AD249),who became one of the he patron saints of medieval Mdina. Visit the spooky network of beautifully frescoed underground galleries and passageways built in 5 AD. 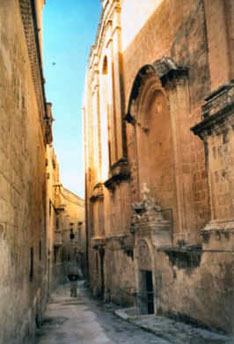 In the afternoon we will walk through the Malta's most atmospheric medieval city of Mdina, also known as the "Silent City". Here we will see the Cathedral which was rebuilt following the Earthquake of 1693. The interior of this magnificent Cathedral deserves full attention. Finally we will enjoy the beautiful view from the city's defense Bastions. Return to hotel. Dinner and overnight. Breakfast at hotel. Transfer from hotel to Malta International Airport assisted by our representative.